The GROHE Pot Filler Wall Mount 2-Handle Kitchen Sink in Stainless Steel features a 20 in. double-jointed swing spout that allows you to easily fill large pots and pans with water. 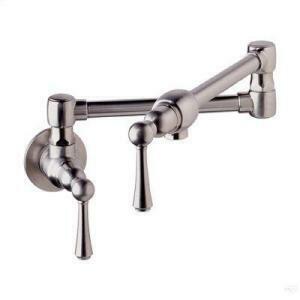 There are 2 quarter-turn shut-off valves and the lever handles meet ADA standards for ease of operation. The stainless steel finish is designed to complement a variety of decorating schemes, giving your kitchen a bright look. Connection size (in.) : 1/2 In.